The Simpson�s Retreat is our beautiful newly built holiday home, it is located on the prestigious gated community of Highgate Park which is only 10 minutes from Disney Theme Parks, and with several golf courses including the renowned Champions gate Golf Resort nearby, as well as the Atlantic and Gulf Coast with there beautiful sandy beaches are within easy reach. 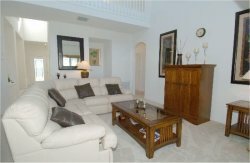 With nearly 3,000 sq ft of air-conditioned living space, this vacation home has 5 bedrooms/4.5 bathrooms and it is beautifully furnished and offers spacious and comfortable living accommodation, it can sleep up to 12 people (Great for family Groups), Downstairs there is a fully equipped Kitchen which includes a luxury ice/water dispensing fridge/freezer, Cooker, Microwave, Dishwasher and several other appliances a breakfast bar with stools and a beautiful dining area for 6 people. The Family room has a bright and airy feel due to the cathedral ceiling This room houses the entertainment center which offers a cable TV, DVD,CD player and a Play Station 2 System complete with games! Internet Access is available to. 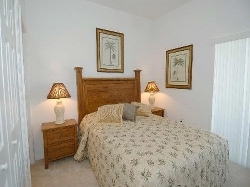 The Queen sized bedroom has cable TV with en-suite bathroom and views and access to the Lanai. There is one Twin bedroom downstairs complete with TV and a themed en-suite bathroom. 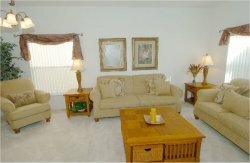 There is an exquisite living room to the front of the house where a quiet relaxing time can be spent. Also Downstairs consists of separate laundry facilities with a large washing machine and tumble dryer, Just beyond the utility room there is a game�s room with a professional Pool table and dart�s board. 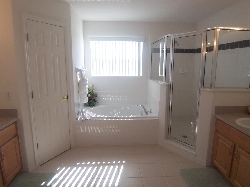 Upstairs the Master bedroom has an American King-size bed, 19�TV with cable, the en-suite bathroom has his and hers basins, a huge shower and a large oval tub with separate WC and walk in closet. The galleried landing leads to two twin bedrooms both with cable TV between them there is a further bathroom. Off the galleried landing there is a nook with a Chaise Lounge seat and coffee table for you to sit and enjoy a good book in peace or just relax and unwind. 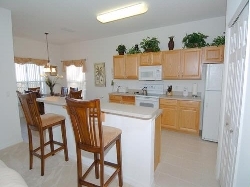 With all these comforts of home �The Simpson�s Retreat� is the ideal place to return to at the end of a long day in Disney World or one of the other many attractions that this area has to offer. You can relax around the swimming pool, sit in the heated spa with a glass of wine and watch the sun set or play a game of pool with your children. 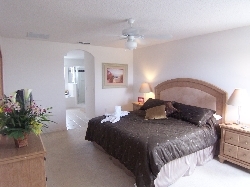 So what are you waiting for if you are thinking about vacationing in Florida and demand the highest standards check the availability of �The Simpson�s Retreat� and book your dream holiday today. Highgate Park is conveniently located to nearby supermarkets, countless restaurants, take-outs, Malls and many other attractions.